1. Mass shooting in Vegas: At least 50 people were killed in a shooting outside the Mandalay Bay Resort and Casino on the Las Vegas Strip during a music festival on Sunday night. Shots were being fired from the 32nd floor of the resort, according to police. MGM Resorts International (MGM), the owner of Mandalay Bay, dropped 3.7% in premarket trading. Wynn Resorts (WYNN), another casino operator in Las Vegas, was off by nearly 1.2%. "Our thoughts & prayers are with the victims of last night's tragic events. We're grateful for the immediate actions of our first responders," MGM said in a tweet. 2. Crisis in Catalonia: Markets are sorting through the aftermath of a contested independence referendum in Catalonia that was marred by violence on Sunday. The euro dropped 0.7% against the dollar, and the yields on Spanish 10-year bonds increased. The main stock market in Madrid opened 1.4% lower before trimming its losses. The referendum was not recognized by Spain's national government, which sought to stop the vote. Hundreds were injured when riot police raided polling stations. The Catalan government said it had earned the right to independence after results showed 90% of those who voted were in favor of a split. However, turnout was relatively low. 3. Monarch collapse: Britain is rushing to help more than 100,000 travelers get back home after the collapse of the Monarch airline on Sunday. It's the country's largest-ever airline collapse, with the aviation authority estimating that around 300,000 future bookings have been canceled. British transportation authorities said they are chartering more than 30 planes for the repatriation flights, creating "a temporary airline from scratch." Shares in Monarch's biggest competitors rallied on the news of its demise. Budget carrier EasyJet (ESYJY) gained over 4%, while Ryanair (RYAAY) added 2.6%. 4. Brexit disagreements: The British pound dropped 0.7% against the dollar amid another round of infighting in the governing Conservative Party. Foreign Secretary Boris Johnson, who campaigned in favor of Brexit, appeared to publicly undermine Prime Minister Theresa May's plan for a transition period. The British Chambers of Commerce urged the government to "demonstrate competence and coherence -- not division and disorganization." "Public disagreements between cabinet ministers in recent weeks have only served to undermine business confidence, not just on Brexit negotiations, but also on the many issues where firms need to see clear action from government closer to home," BCC Director General Adam Marshall said in a statement. 5. 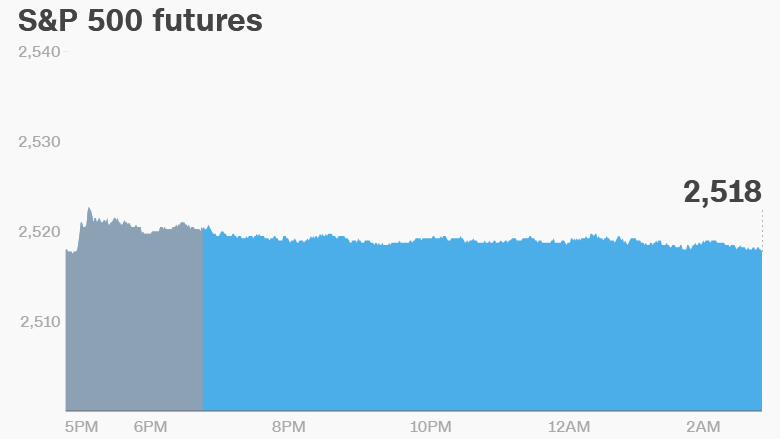 Global market overview: U.S. stock futures were higher ahead of the open. Most European markets were in positive territory, and Asian indexes posted gains. Markets in China are closed this week. The Dow Jones industrial average closed 0.1% higher on Friday, wrapping up eight consecutive quarters of rallies. It's the index's longest winning streak in 20 years. The S&P 500 and the Nasdaq both hit record highs.